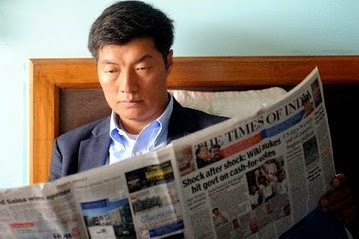 Literarily, the Tibetan word “Lobsang” means “intelligent” and “Sangay” means “lion” and certainly, Lobsang Sangay, our prime minister, a graduate of Harvard Law School is intelligent and elegant as well as smart and skillful. But then, is he really brave like a lion, a true son of Lithang, the land of warriors? Maybe not, maybe he is just too kind, as he himself describes as a “kind-hearted-lion” in Wikipedia, the free encyclopedia! Last year, I wrote an article entitled “Lobsang Sangay, an Empty Vessel,” and the article generated a lot of hits. A few of my readers even criticized me claiming I wrote the article for the sake of hits. On the other hand, a lot of Tibetans and non-Tibetans, who are staunch supporters of the fight for Tibetan independence, applauded the article as “an eye opener” and urged me to write more such articles. At the same time, some of my friends and relatives strongly discouraged me to pen such articles, and a few even told me that if I write such articles, I will never get a job in the Tibetan community. That sounds true when I look at what is happening to Jamyang Norbu who is a very die-hard Tibetan independence activist and a prominent writer and a critic of our Tibetan government in exile. It is a very well-known public secret that he is banned from appearing on radio or television programs that have links to our exile government. And he has become sort of a taboo in our community, so most of the organizations and schools in our exile community try to distance themselves from the man who is one of the most prominent Tibetan intellectuals and writers in English. That is really sad. Instead of making the best use of such rare, vocal intellectuals, for whatever reason, our government is always trying to choke their voices. So, it is very palpable that the gap between Tibetan independence activists and autonomy advocates is becoming bigger and bigger, and the result could be catastrophic unless we can put an end to this ideological gap while His Holiness the Dalai Lama is with us. Many of us worry about what will happen after the Dalai Lama, but what will happen after the Dalai Lama is totally in our hands. If we are worried about the situation after the Dalai Lama, and if we truly trust the guidance of His Holiness, then it is high time for us to come out of our small boxes and give a chance to the political strategy that is adopted by the Dalai Lama, which is a 100 percent promise to be part of China if Beijing agrees to give us a genuine autonomy. Looking at recent speeches of His Holiness the Dalai Lama where he occasionally urged the Tibetans in exile to think twice before holding any protest against the Chinese visiting leaders, indirectly reasoning that these protests might do more harm than good to the Tibetans in Tibet. If all Tibetans in exile and in Tibet couldn’t put that urge in a united way and seek for a genuine autonomy rather than independence, then, such speeches could probably become nothing more than a dividing factor between the two ideologies in our community – independence versus middle way approach. Many might disagree, but we need to change our attitude towards China to some extend and try other possibilities that would help to ease the tension inside Tibet. We are very prone to judging the Beijing government based on what they did to us in 1950s, 1960s, 1970s and 1980s. We need to look beyond Tibet, beyond China. The situation inside Tibet is becoming worse and worse and solving the issue is tougher and tougher. This is not only because of Beijing’s bad policies, but because of its ever increasing business relationship with other countries including one of our greatest supporters, the United States of America. Almost all nations, in one way or another, are Beijing’s business partners, and they care about their own national interest more than the Tibetan cause. That is a fact that we need to accept. So, there is nothing to get carried away about when President Barack Obama describes the Dalai Lama as a “good person” or a “good friend.” When he says “good friend” or “good person,” he means it, and the whole world knows that, but what magic can happen to the Tibetans with such mere empty words? In fact, big words and big promises are nothing more than lip service that serves their own interests rather than ours. We are, in a way, becoming their business card with the Beijing government. It is really sad that this lip service and our false promises are, in a way, becoming the source of hope and inspiration for our brothers and sisters inside Tibet. Maybe it is time to let Tibetans inside Tibet know that the world will never free them from the Chinese oppression and suppression and urge them to be more realistic rather than building castles in the air. No one can deny that Beijing’s policies force Tibetans in Tibet to set themselves on fire, but are we also not to be blamed for giving them false hope and empty promises? When a world leader shakes hands with our prime minister, I see one more Tibetan in Tibet getting inspired to throw some free Tibet leaflets in the air or shout free Tibet slogans. Enough is enough. No more lip service. Stop uttering any further word if the word doesn’t mean what it says. Instead, we need to focus on what we can do. We need to be realistic. Maybe creating an environment that empowers our youth in Tibet through education might be the best way to preserve our culture, language, and the spirit of struggle. With the rise of China’s economy, many of our fellow Tibetans in India are going back to Tibet. Every day, around 50 to 100 Tibetans line up at the Chinese Embassy in Delhi for a visit to Tibet or going back to Tibet permanently. A teacher of mine, back in my school days, once told me that it is the mission of the Tibetan schools in India to educate the children from Tibet and eventually send them back to Tibet so that they can educate other children inside Tibet. But until recently, who would go back to Tibet after graduation from school? But now, it seems things have changed. In fact, these days, for many Tibetans in India or Nepal, going back to Tibet is their first choice after failing to get a visa to the west. Many agree spending their life in Tibet with their families is better than living a lonely life in India and struggling their whole lives. We should acknowledge that China, in recent years, has changed a lot, not just its economic policies but its political and religious policies as well. Look at our own Beijing based blogger and writer Tsering Woeser who is so vocal and so critical of the Chinese government but doesn’t get punished like Tibetans in Tibet do. Unless she is an agent of Beijing government, she represents as an example of many other activists, writers and artists in China who are so vocal and so critical of the Beijing government but hardly get punished by the government. In fact, some even publicly announce their support for the Dalai Lama’s middle way policy and they hardly ever get arrested like our brothers and sisters in Tibet do. So, it seems that there is relatively more freedom in Mainland China than in other Chinese occupied areas, such as Tibet. It also might be a sign that Beijing is ready to give up their repressive and oppressive policies towards the Tibetans in Tibet, as soon as the two sides can trust each other. We also must accept that around ten percent of Tibetans in Tibet still sincerely recognise that China took over Tibet, and they are genuinely willing to be under China, rather than having a separate nation. Meanwhile, Beijing’s new policy and strategy of giving monetary gifts to those Tibetans who marry a Chinese man or woman is a part of their plan to completely end the Tibetan race. It is not too late to feel the feelings of Tibetans inside Tibet. Unfortunately, many of us who are born in exile and don’t have any family members or relatives in Tibet are unable to feel that feeling or connect with the Tibetans inside Tibet. Maybe it is because, for us, Tibetans inside Tibet are just another fellow Tibetan, whereas, for many, Tibetans inside Tibet are not just another Tibetan but their biological brothers, sisters, parents and relatives. Many Tibetans in exile whose families are still in Tibet, when speaking with their parents, other relatives, and friends there, discourage them from becoming involved in any political activities. In a way, they worry about their family members in Tibet more than Tibetans in Tibet actually fear for themselves. Several years back, I interviewed a Tibetan man in India whose youngest brother in Tibet set himself on fire in protest against the Chinese government, and he requested me not to mention his name in fear of Beijing’s repercussion. He said he didn’t want to be a “troublemaker for my family in Tibet,” adding that his involvement in politics in exile could cause punishment for his family members back in Tibet. It is high time for Tibetans to genuinely trust the middle way approach that was introduced by the Dalai Lama and try to pave a way to end the repressive Chinese policies, the cultural assimilation, and the marginalization of the Tibetan population. There are a number of Tibetans in exile as well as in Tibet who are actively trying to build schools and libraries in Tibet, especially in remote nomad areas, and maybe it is time for us to focus on aiding and building schools in Tibet. Empowering the youth in Tibet through education seems the best strategy to keep the spirit of struggle alive. To do that, we need to have a favorable environment, and we can obtain that environment if and only when we can achieve successful negotiations with the Beijing government. If we can create such an environment, then we can, not only educate the children in Tibet, but also build friendship with our Buddhist brothers and sisters in mainland China. In recent decades, hundreds of thousands of westerners have found interest in Tibetan Buddhism, and, through Buddhism, we were able to put the Tibetan issue on the international platform. We can probably do the same with the Chinese as well, as more and more Chinese are interested in Buddhism in recent years. Our prime minister, Dr. Lobsang Sangay has to be brave and use his wisdom and strategy to do whatever he has to do in order to create that environment. Despite criticism from different angles and groups, he shouldn’t forget that he is the chosen one, entrusted and elected by the majority of Tibetans in exile and supported by those in Tibet. If he can live up to that trust and use his full strength then we are likely to see him as a history maker, not just a newsmaker who is constantly on the headlines. NOTE—Tendar Tsering is a U.S. based Tibetan journalist. Previously he had worked with several international news portals from India, writing about Asian relationships with the Untied States, and about human rights issues in China and Tibet. You nailed it this time Tendar la! This is what I call a writer who pin point core issues and bring unity in our small community.